No sane person traveling to Nepal should spend five weeks in Kathmandu. It's dirty, polluted, and the infrastructure is circa 1930's (unpaved roads, frequent power outages, poor sanitation...). We did not plan to be there so long, but life on the road is...well... it's life. Things happen when you travel long term and sometimes you just have to make the best of unplanned situations. After hiking the Annapurna Circuit, we returned to Kathmandu to pick up the stuff we had stored at a hotel and take care of some administrative business. I had to get a new passport because I ran out of visa pages. We also needed to extend our 30-day Nepal visa and obtain entry visas for China, our next destination. When we left hip, clean, on-the-lake, fluffy-white-clouds Pokhara at the end of our trek, we thought we would be returning in just a few short days. Our plan was to get things in motion in Kathmandu and then return to Pokhara to enjoy a couple of weeks exploring this beautiful area of Nepal before moving on. Nope. Our destiny lay in Kathmandu. I will not bore you with the details of bureaucracy in Nepal. Let me just say that it took five long, patience-trying weeks to accomplish our tasks. Just...aaaargh. So, how did we spend out time? When we were not suffering from food poisoning, day-drunk, or re-watching old movies on Nepalese HBO, we did manage to get out and explore the city and the surrounding valley a bit (armed with intestinal meds and face masks tightly secured). 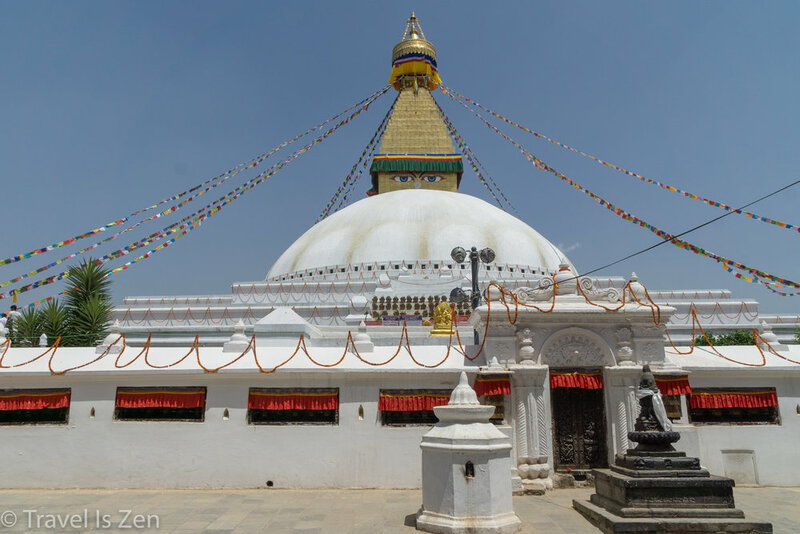 Bodhnath Stupa is a UNESCO World Heritage Site and has been considered sacred ground for centuries. There is a legend that an ancient Licchavi king sacrificed himself to the gods so that his people could find water. A grieving son flew a hen from the palace and constructed a temple where it landed (at Bodhnath) to commemorate his father's deed. The stupa (the large white mound) that exists today is a rather recent construction; the original was destroyed by the Mughals when they invaded in the 14th century. This temple is tucked behind a congested, busy street, surrounded by trinket shops and restaurants catering to visitors. It is a nice respite from the chaos and congestion of Kathmandu. 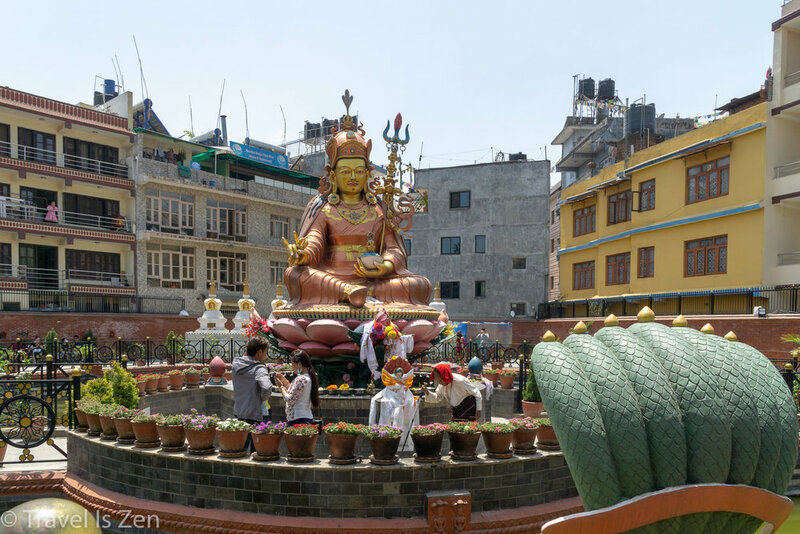 For Tibetans, it is one of the holiest sites in Nepal. Otherwise known as the "monkey temple" (for obvious reasons - monkeys are everywhere), Swayambhunath is another Licchavi-period temple (around 400 AD-ish) and one of the most important Buddhist pilgrimage sites in Nepal. It sits high on a hill and you can see the eyes of Wisdom and Compassion staring down as you approach the temple complex. What looks like a nose is actually the Nepalese symbol for "one", symbolizing the unity of all earthly things. 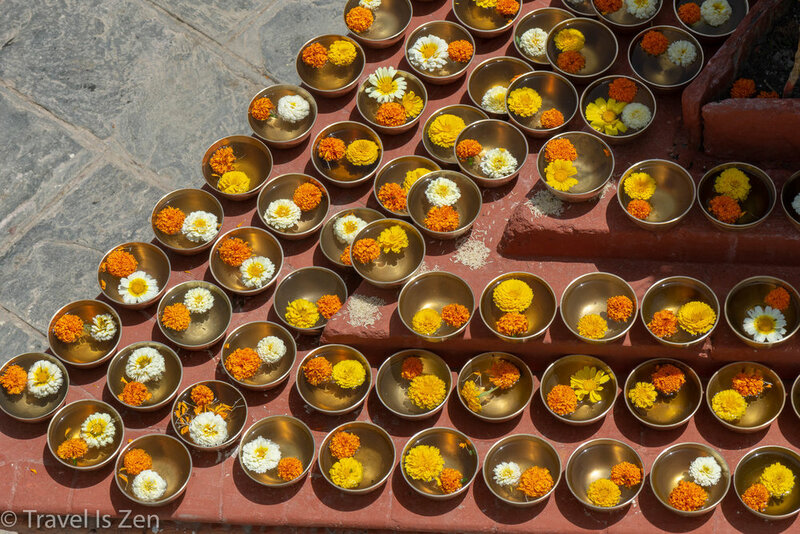 In the morning, hundreds of Buddhist and Hindu devotees climb the steep steps to walk clockwise around the base of the stupa, spinning prayer wheels and performing rituals. The air quality in Kathmandu is bad. We tried running once at 6:00 in the morning and spent the rest of the day blowing out brown junk from our nasal passages. We did our best to get out of the city as frequently as possible to get some exercise, fresh(er) air, and see some of the historical sites beyond the haze. We did several day hikes around Chandragiri Mountain and Chitlang. We took a bus trip to Bhaktapur to see the city's exquisite wood carvings. And we did a little hiking in Dhulikhel, as well. The countryside is culture-rich, with loads of ethnic diversity. I will say that, despite the pathetic state of government in Kathmandu, Nepalese people are some of the kindest and most genuine people we have encountered. When I think of the lovely staff at Dream Nepal hotel, the helpful folks at Mums hotel, or the stern stout woman at the Korean restaurant in Thamel (who eventually warmed up to us), those people put a smile on my face. For their sake, I hope the country finds a dynamic leader or a productive political party that can get over itself long enough to actually do some good for the Nepalese people. They deserve better.